I’m old enough to remember when people actually sent and received postcards and I always seeing one from some mysterious far-off place like Hawaii or Arizona arrive in our family mailbox. Postcards were fun to examine and share and they usually got posted on the refrigerator door or inboard for all to see. So, what happened to postcards? I never see the racks of cards in drugstores or even where tourists shop. Another high-touch casualty of our high-tech life? It turns out that postcards aren’t extinct. They made the jump to the digital age with a web service and app called MyPostcard. 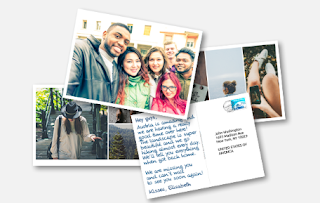 The service lets users select or create real printed postcards and send them through the appropriate postal service. The service is available to anyone in the world, regardless of where they live or where the card will be delivered. Users can select a photo from their image collections on their mobile phone or desktop computer and write a personal message that will be printed on the card. In addition to postcards, the MyPostcard also offers variety of greeting cards, including holiday or birthday cards greeting cards, that are delivered in an envelope. Prices for the cards start at $2.29, which includes shipping. The cards are delivered to recipients in the US or Europe in 3-5 business days and to Australia or Asia in 6-10 days. For a closer look at MyPostcard, check out the video below and visit the MyPostcard website and follow @MyPostcardapp on Twitter. The app is available as a free download in the iTunes App Store or the Google Play Store.